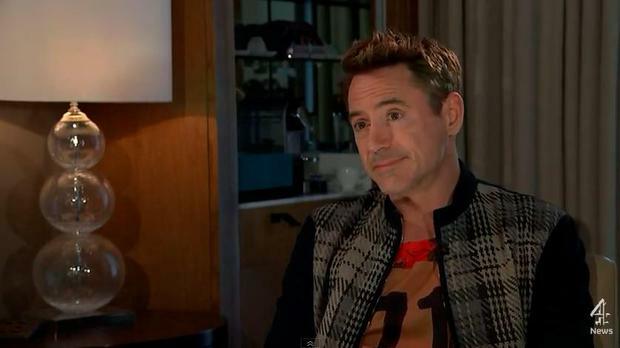 Robert Downey Jr. reportedly left a recent interview because he didn’t see the point of it. The 50-year-old actor hit headlines earlier this week when video footage of him walking out of an interview with the UK’s Channel 4 News anchor Krishnan Guru-Murthy emerged. Robert met with Krishnan as part of his Avengers: Age of Ultron promotional tour. When the journalist started asking personal questions, the Academy Award-nominee became frustrated and cut the discussion short by abruptly leaving the room. Over ten years ago, Robert was arrested several times for drug-related charges, but in a 2008 New York Times interview, the star insisted he’s been clean since 2003. It’s claimed Robert actively maintains his sobriety and was somewhat offended when Krishnan asked “whether [drugs] is still something” he’s struggling with. “Here is the thing about Bob, he is so active in the Alcoholics Anonymous and Narcotics Anonymous community in Malibu where he lives,” the insider noted. “From attending meetings, being an active sponsor to several people, and buying cakes for members’ sobriety milestones, Bob is living the programme everyday. It’s something intensely personal and private for Bob, and he doesn’t do it for the press.